Watch Insertion Fees: When listing in the Auction format, pay attention to the insertion fee chart. A book listed at 24.99 will cost you $.35, but a book listed at 25.00 will cost you $1.00. Doing a quick search today, there are about 1240 books listed in auction format with a starting price of $25.00, which means, eBay collected $806.00 in insertion fees for an additional $12.40 in extra pennies to the seller. I can’t stress this one enough. It’s totally in your control and it takes literally seconds to glance up at the insertion fee chart. Consider Selling in Lots – In most categories, selling in lots is a great way to reduce listings fees AND increase the success rate. Using Vendio eBay research tools, the below chart shows that listing single books is much more costly than selling books in lots. This is true in many categories. 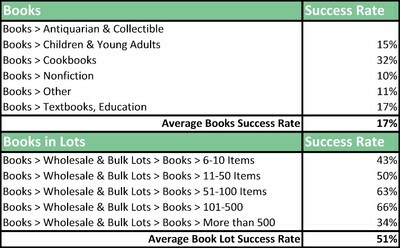 For example, on average, Non-fiction books run at a 10% success rate, which means that you will need to list that book about 10 times for it to sell. Listing a book 10 times costs much more than listing a lot of books once or twice. And it’s likely you’ll get more bids on lots because bidders may be after different books. 3. Watch your Features – eBay listing features such as listing designer, scheduled launches (10 cents each) can be mitigated. If you want templates or want to schedule – Consider a third party listing software. Vendio Platform includes scheduled listings, and a huge number of templates, and it doesn’t cost an extra 10 cents each. Really, stop wasting your money for these 2 features. Other features, such as gallery plus or subtitle *might* help your success rate. Research (and yes, Vendio Research) will tell you what features drive successful sales for your item. a. Format – Is it listed in the correct format (fixed price or auction). It makes no sense to list an item in Fixed Price if it’s a one-of-a-kind item and it will not be seen in search results. Consider your DSR ratings and how you place in Fixed Price search results. b. Keywords – Make sure that a buyer can find your item. Think about what a buyer would be searching for and what search terms they would use. Research keywords to make sure you are using the ones that drive success. There IS a difference between using Season 1 and Season One. c. Listing Time – Especially important for auction listings, you’ll want to have your items ending when people are buying. Quite often, I hear “Sunday Night is the Best Night”. Research shows that’s not true. These are the hard ones. They will take work. They will take time and the rewards come slow. But there are great rewards. b. Open an off eBay Store. Vendio has a 100% free (no listing fee, no final value fee, no fee for images) store. It’s so easy to fall into a trap of list, repeat, list, repeat and so many folks never move beyond that. But in order to grow your OWN business, you should really consider creating your OWN presence online. This entry was posted on Thursday, November 12th, 2009 at 10:50 am	and is filed under eBay Marketplace. You can follow any responses to this entry through the RSS 2.0 feed. Both comments and pings are currently closed. I have used Vendio research and to be honest it is great. there is great information in it. Thank you for facilitating our business.